DALLAS – MidMajorHoopsReport.com covered two of the top tourney’s in the Lone Star State, The 74th Annual Dallas Independent School District/Coca Cola Basketball Tournament and the 56th Annual Whataburger Basketball Tournament in Ft. Worth, Texas on December 27 and 28. 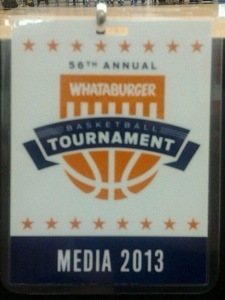 Top players such as Elijah Thomas(Lancaster HS), Jawun Evans(Dallas Kimball), and Admon Gilder(Dallas Madison) were at the Coca Cola Tournament and Over at the Whataburger Tourney players such as Myles Turner(Euless Trinity), Elbert Robinson(Garland Lakeview Centennial), and Quentin Snider(Louisville Ballard) . MMHR learned on Thursday, the first day of the Coca Cola, Lasani Johnson (6’3″ G Dallas Bishop Dunne), son of former NBA player Larry Johnson scored 103 points in two games. Against Adamson HS, he scored 40 points in a 65-64 loss. Later in the day, Johnson scored 63 points in a 85-83 double-overtime loss to Copperas Cove. This display set up anticipation for day 2 at the Coca Cola. This game was no more than a 2-3 possession game throughout. Both teams were intent to impose their will upon each other. Wilson came out strong in the 1st quarter and led Horn 16-9. Horn countered with a 20 point 2nd quarter and cut Wilson’s lead to 35-29 at half. Horn continued its attack along with defensive toughness to cut the Wilson lead to 3 points at the end of the 3rd quarter(43-40). Wilson heard the bell in the 4th quarter and countered with a 21 point quarter to win 64-57 over Horn. Wilson was led by Kerwin Smith‘s 22 points. He is a 6’9″ Post and Grand Canyon signee. Smith is long, bouncy, and keeps the ball up high all the time. Horn was led by Alan Hodge(UNSIGNED class of 2014), 6’0″ G, with 24 points. He is a good spot up shooter and has a nice one and two dribble pull up. Hodge is built like a tank. He was strong enough to guard 6’8″ and 6’9″ posts like Byron Eaton in the 2004 Big Time in Las Vegas. *Hassan Thomas(W. Wilson): Class of 2015, 6’7″ Wing/Post, San Diego born, Very athletic(Will see a player in the key and dunk on you), puts the ball on the deck using a hard jab step to set up his drive, and one of a few players I have personally seen lock up Top 15 player Rashad Vaughn of Findley Prep on the defensive end. *Craig Martin(W. Wilson): Class of 2015, 6’0″ PG/Wing, pit bull on ball defense, and one of the leading scorers in the Dallas area. *Carlos Simpson(W. Wilson): Class of 2016, 5’9″ PG, pushes the rock at a break neck speed, great vision(Head is always on a swivel), slick passes ala Pete Maravich, runs the pick and roll like a pro, shoots the 3 ball, and had a heart procedure done in 2012. He is a mid major player at his present-day size. If he continues to grow, Carlos is a high major player all day everyday. *Mykeus Woods(W. Wilson): Class of 2017, 6’2″ W, one to watch, nice shooting stroke.